10 years ago today, I was a freshman in high school. I was in 2nd period World Geography when a student from the class across the hall ran in and yelled, "A plane just crashed into the Twin Towers in New York, come watch!" We all ran across the hall to the other classroom to watch the events unfold on television. I had moved to Texas less than 2 months before from New Jersey because I wanted to go to high school in Texas. As I stared at the TV, watching, I couldn't stop thinking about my sister, who lived in New York, my friends that I had just finished 8th grade with, who had parents that worked at the World Trade Center, my cousin, who worked downtown, or my mom, my friends, my family, everyone in New Jersey and New York. Fast forward, 10 years and I'm one semester away from finishing my Master's degree in International Affairs.We talk about September 11 on a daily basis...about what international relations means in the post-9/11 era. Just like the Cold War impacted global affairs, 9/11 had the same effect on forever changing the way that the world works. Today isn't a day to remember September 11, it's a day to ensure that we never forget. 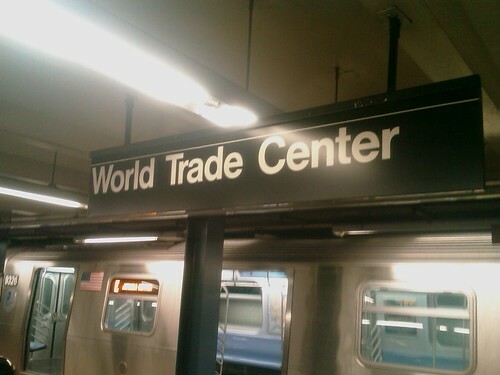 Every day when I go to class, I take the E train to World Trade Center. I step off the subway and walk two blocks to class never hesitating to think about that fateful day, 10 years ago, and stop to say a little prayer. I woke up this morning like I do every Sunday and went for my long run. And I thought about the significance of today during every single one of those miles. When I got home, I watched the Memorial on TV and couldn't stop thinking about everything that happened that day. The Pilot is flying today. He finished his commercial airline training 3 weeks ago and had his first trip last week. Today, he's flying in and out of New York for most of the day. Thinking about him in the air today has led me to really think, for the first time, about the passengers and flight crew of United Airlines Flights 93 and 175 and American Airlines Flights 11 and 73. May they, and all of those who lost their lives on September 11, 2001 rest in peace. May the first responders, fire fighters and police officers who passed away from injuries and illnesses that were sustained or developed as a result of their service on that day, rest in peace. And may the women and men who have entered into service to protect the United States after the September 11 attacks remain safe and may those who have lost their lives, rest in peace. Beautiful post, Christy. Thanks for sharing your story from that day. I can't imagine how it must have felt to really know people who could have been directly affected by the tragedy like that. God Bless America for sure. This is such a beautiful post, Christy. When I was in NY this summer and saw Ground Zero, I noticed that all around the area, people were still milling about, going to work, going about their day - they had moved on, but I know that they never forget, much like I never will! The way you present things is very thoughtful. I would be keeping regular track of your blog. What a beautiful post. We are all united as one, and need to remember this day forever. Never forget.